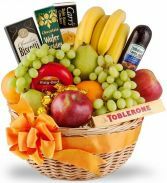 When you want to express your best wishes in a big way, send this basket filled with fresh fruit and an impressive array of gourmet treats. Nothing's grander! 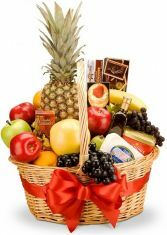 A large wicker tray is packed with fresh fruits such as apples, pears, and pomegranates, then filled to the brim with favorite foods such as honey, short bread, tea, chocolates, cookies, and much more. 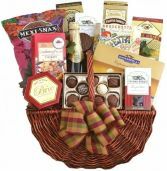 A feast for the individual, this luxurious basket is also perfect for feeding a crowd. 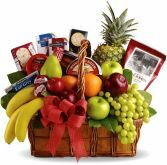 Pictured food components may vary to ensure freshest basket possible. 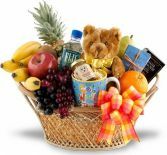 Send your heartfelt sympathy and words of comfort with this beautiful Condolences Sympathy Gift Basket. 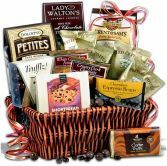 This luxury comfort basket is filled with a huge assortment of gourmet food items including crackers, cheese, salami, pistachios, butter cookies, chocolate chip cookies, smoked salmon, butter toffee pretzels, dried fruit, fudge, tea, cake and popcorn. A comforting and caring gift that will be appreciated in their time of loss. 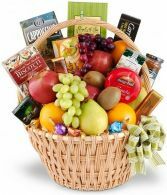 Pictured basket and food components may vary by season. 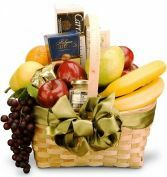 Filled with an abundant selection of fresh fruit and gourmet foods, this elite basket is a delicious gift for any special occasion A classic wicker basket is filled with ripe, seasonal fruits such as oranges, apples, bananas, pears, grapes, peaches, Gourmet items may include crackers, smoked sausage, nuts, cheese spreads, preserves, and candies. There's definitely something for everyone! Flowers convey a message that cannot be put into words. 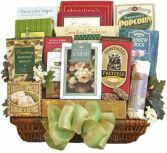 ROCKVILLE FLORIST & GIFT BASKETS of Garrett Park, MD provides a variety of fresh, fashionable floral designs to ensure that your gift is one of elegance and beauty. 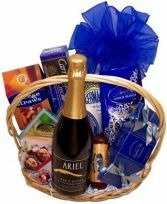 When you're looking for a unique hostess gift, token of appreciation or just a surprise to brighten someone's day, let ROCKVILLE FLORIST & GIFT BASKETS customize and deliver one of our many fun, decorative & luxury gifts! We create dazzling presentations that are sure to please for any gift-giving occasion. 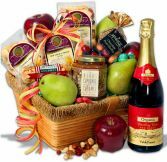 To get your custom gift items, come by and see ROCKVILLE FLORIST & GIFT BASKETS - your local Garrett Park, MD florist.